Rich in vitamins & minerals: This supplement has excellent levels of all important nutrients including antioxidants and Vitamin D.
Mineral nutrients include GTF chromium - this is a particularly bioeffective form of GTF chromium which can help regulate blood sugar. Wholefood Supplements: These are the only genuine Wholefood supplement products on the market. All our Wholefood products use food metabolic pathways. For adults and children: This supplement is a good all-round supportive multivitamin and mineral formulation for adults and children of 12 years and over. For those of you who prefer capsules it is the ideal choice. This supplement is suitable for Vegetarians, Vegans and those with Candida and yeast sensitivities. Free from yeast, wheat, starch, gluten, soy, lactose, added colourings, sweeteners and preservatives. Capsule shell (hypromellose); vitamin C; vitamin E; magnesium citrate; niacin; pantothenic acid; hydroponically grown cruciferous vegetable (Brassica Juncea) providing: zinc, iron, manganese, copper, selenium, chromium and molybdenum; para amino benzoic acid; vegetable magnesium stearate; vitamin B6; thiamin, riboflavin; beta carotene; sodium borate; folic acid; potassium iodide; vitamin K; vitamin D; biotin; vitamin B12. Take 1-2 capsule daily for adults and children of 12 years and over, or take as directed by a practitioner. 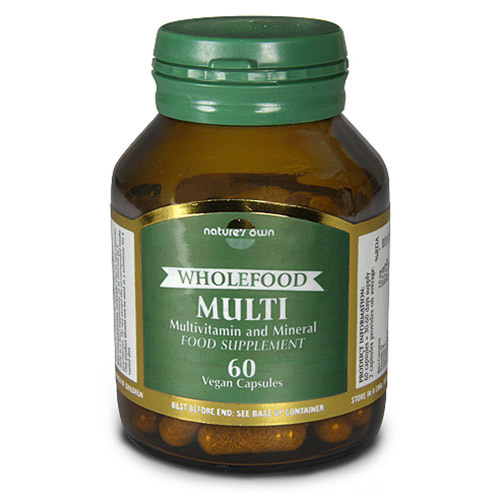 Below are reviews of Natures Own Wholefood Multi Vitamin - 60 Vegicaps by bodykind customers. If you have tried this product we'd love to hear what you think so please leave a review. 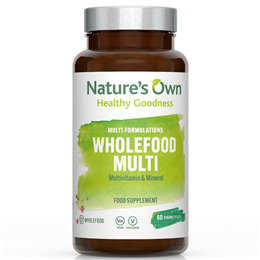 Nature`s Own Wholefood Vegan Multivitamin and Mineral supplement is based on providing at least 50% of the established RDA for all the main nutrients, it is an effective supplement for all ages.